Modelling AFVs really does give tremendous scope to the modeller for adding interesting effects to the appearance of their models. I wont try to cover the established techniques like dry-brushing; they are already covered at the web sites of some excellent modellers. But I will talk about some techniques Ive discovered for myself during the course of making my own models & dioramas. I may not be the first to figure them out  but Id like to share them anyway. Some modellers use sand-paper to reduce the scale thickness of the certain parts of the model, an effective, albeit time-consuming method. Instead try repeatedly scraping a scalpel knife along the surface that you want reduced. This is a far quicker way of achieving the same effect. Once the plastic has been thinned, you can then bend it into the shape you require. Very effective for bending track-guards. I find a blade size No.15 ideal. Be careful though, these things are sharp. If you want an alternative to plaster, try something called Sculptamold by Amaco. Its made in the US, but can be bought here in Europe (Art supply shops mainly). I haven't used plaster so I can't offer a direct comparison. But this stuff has always given very good results. It mixes with water to produce a mush-like paste that can be moulded into any shape you wish. It dries plaster hard (place in an oven to speed up dry time significantly). The benefit of this stuff is that with a little shaping it can produce a very realistic terrain-like finish. If you find it difficult to paint fine detail on 1/35th scale figures, consider investing in a combined lamp/magnifying glass. These are a great aid for painting facial details and other small areas. This magnifies your work area x 2. So you need a really small brush 00 size or less. It takes a while to adjust your brush action & angle when working under magnification, but once mastered it makes life much easier. It may go without saying, but a good tweezers is essential. 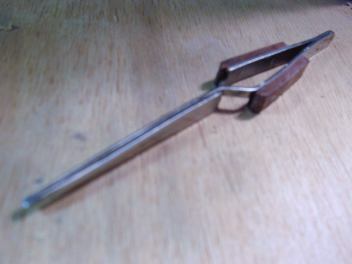 I'd highly recommend the self-locking type (see below) - this tool was absolutely essential working on the wooden ship - but its equally handy for ordinary kits. Less likely to drop small parts, and it also allows you to position the part at awkward angles. 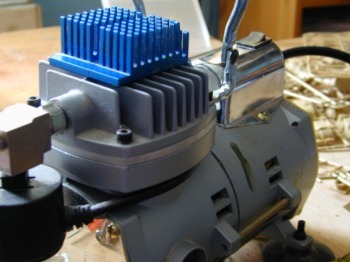 If you have a heat-sink from an old microprocessor, try placing it on the body of your air-compressor. It really does help draw the heat from the unit housing. This allows you to run the compressor a little bit longer than normal & for it to cool down quicker. However, this DOES NOT mean that you can overrun it too much. Not only is it dangerous, it would probably shorten the life of your compressor.